Blue Origin's New Shepard capsule, with its in-flight escape motor highlighted in green. Blue Origin, the spaceflight company run by billionaire Amazon.com founder Jeff Bezos, will perform a critical "in-flight escape test" of its New Shepard suborbital space vehicle next week. The uncrewed flight, which is designed to see how New Shepard would respond to a launch emergency, will take place Tuesday (Oct. 4), Blue Origin representatives announced via Twitter today (Sept. 29). The company will webcast the test live, with coverage starting at 10:50 a.m. EDT (1450 GMT) on Tuesday. Blue Origin has already launched the same New Shepard booster on suborbital flights four times since November 2015; each time, the rocket has aced its landing. But the Oct. 4 jaunt will likely be its last. "Goal to test at most stressing flight condition. 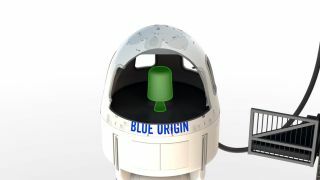 Likely to lose booster after escape," company representatives said today via Blue Origin's Twitter account, @blueorigin. The "escape," in this case, is that of the New Shepard capsule, which would need to get itself out of harm's way very quickly in the event of a real-life problem during launch. "A solid rocket motor fires for 2 seconds, quickly separating the crew capsule away from the booster," the narrator says in a Blue Origin video describing next week's test. "Once away, the capsule enters a standard descent profile, deploying drogue and main parachutes before coasting down to a landing." New Shepard was named after Alan Shepard, who became the first American in space when he launched on a suborbital flight in May 1961. Blue Origin announced earlier this month that it's building a big orbital rocket named New Glenn, after John Glenn, the first American to circle the Earth.